Great turnout for Saturday Spin. The following club members took to the roads last Saturday. The grass could have done with cutting but there are more important things to do on a fine February morning. Out cycling were Mary McCarthy, Marie Hartnett, Ber Gammell, Robert Shanahan, Jerry Ryan, Jonathan Moloney, Edmond O’Reilly, Sam Hand, Paul Finn and John Crowley. Well done everybody. We had a very large turnout for the underage cycling on Saturday evening, excellent skill session improving bike handling, braking and using gears while cycling through cones. Great to see the younger members improving their skills. Another lovely morning for cycling. Raring to go were Mary & Willie McCarthy, Stephen Finn, Michelle Gammell, Robert Shanahan, Martin Lake, Stephen Hehir, Brendan Houlihan, Jonathan Moloney, Jerry Ryan and Shane O’Brien. The route planned was a reversal of an “old favourite”. Kilmallock, Knocklong, Ballylanders, Ballintubber, Kilfinane, Ballyorgan, over Glenanar and back to Kilmallock. It was cold and misty on Ballintubber but that was the exception. It was nice to see so many other cyclists out and about and it just confirms the huge popularity of cycling. Well done to everyone getting out on the Wednesday evening spin. It’s nice to break up the week with a few miles. Out spinning last week were Jerry Herbert, Sean Burchill, Adrian Gammell, Michael Gammell, Ber Gammell, Paul Gammell, Sam Hand, Brian McCarthy, Willie McCarthy, Jerry Ryan, Edmond O’Reilly, Jonathan Moloney, David Walsh, Aaron Walsh, John Carey. Mike Sexton, Robert Shanahan, Brendan Daly and Mathew Gammell. Sophie Mulcahy Mini Tour of Munster. The following club members are taking part in this 380k fund raising cycle for little Sophie over three days starting Friday 2nd March. Timmy Hanley, Jerry Ryan, Sean Burchill, Donal “Dodo” Kelly, Willie McCarthy, Owen Tobin, Stephen Finn and Shane O’Brien. The very best of luck lads, don’t forget the Sudocrem!! 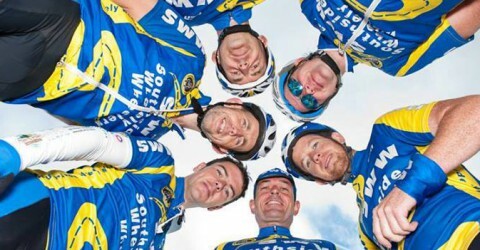 Well, the 2012 touring season kicked off for the Southside Wheely Wheelers with the “Donal Crowley Memorial Cycle” last Sunday 19 Feb in Blarney. The club were out in force and a trip to Blarney Castle was never on the agenda. 100kms of cycling was and the following club members left the famous town at quarter past Eleven to take on the challenging course, Paul Gammell, Mike Duggan, Edmond O’Reilly, Martin Lake, Jan, Eoghan and Tadhg Murphy, Stephen Hehir, Brendan Daly, Pat O’Donnell, Willie McCarthy, Mike Sexton, John Carey, Mike Gammell, Stephen Finn, Brendan Houlihan, Shane O’Brien, Adrian Gammell and Liam Carroll. If I’ve forgotten anyone please forgive me. As the cyclist assembled for the off Mike Sexton spotted the legend that is Sean Kelly, himself preparing for the spin. He kindly joined us for a photo and laughed off some light hearted slagging before heading for the start line. As the flag dropped a massive crowd of cyclists headed straight into a 25km “drag” that soon had the field scattered. People settled into different groups and made their way around the course in brilliant sunshine. A few punctures broke up the journey for one group of Wheely Wheelers but even this didn’t dampen spirits and everyone cycled happily back to Blarney to complete the tour. There were a few club members taking part in their first tour, fair play to them they made it look easy. Well done to all club members that took part and if this was anything to go on we’re going to have a great year on the roads of Ireland. Wednesday Night Light Cycle 15 Feb. The Wednesday evening spin is going from strength to strength. Thankfully the evenings are starting to brighten and we all look forward to the time we can leave the car park with the lights off. Out spinning last week were Jerry Herbert, Sean Burchill, Adrian Gammell, Michael Gammell, Ber Gammell, Paul Gammell, Sam Hand, Brian McCarthy, Willie McCarthy, Jerry Ryan, Edmond O’Reilly, Jonathan Moloney, David Walsh, Aaron Walsh, John Carey. Mike Sexton, Robert Shanahan, Brendan Daly and Mathew Gammell. Turbo Thursday was well attended last week in the hall in Bruree. Only two more weeks left so if you fancy going real fast (without moving an inch) and improving your fitness get yourself to Bruree tonight or next Thursday. As always Turbos will be shared so if you don’t have one grab your bike, a drink and a towel and come along anyway. Club Spins and Medieval Banquets!! I’m afraid information is a bit sketchy this week on the Saturday Spins. Willie McCarthy and Ger Finn were off bright and early, leaving the car park at 8.00am to take on the three hills route. Willie is putting the hard miles in for the upcoming Sophie Mulcahy Cycle, well done lads. I didn’t hear who ventured out at 9.30 so my apologies to all concerned. My “source” will be back next week and normal service will be resumed. 8.30am Sunday morning saw a slight fog over the car park as the Wheely Wheelers assembled for the Sunday roll-out. The plan was to head for Glennanar, Ballyorgan, Kilfinane, Ballintubber, Ballylanders, Lisvernane, Christ The King, Tipp, Kilross, Knocklong and home. As we had a few fairly new members, it was agreed they could turn off for home when the legs cried enough. You have to build up the miles so that was a wise move. Good to go were Stephen Finn, Brendan Houlihan, Daithi Creedon, Willie McCarthy, Shane O’Brien, Pat O’Donnell, Edmond O’Reilly, Mike Meade, Gerry Ryan, Martin Lake, Jerry Herbert and Robert Shanahan. While it wasn’t the Costa del Sol, the fog lifted and it turned out to be a lovely morning for cycling. Hear ye, hear ye, hear ye!! SWW social evening coming up. 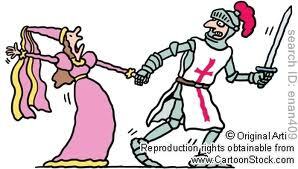 Plans are afoot for a medieval banquet in Bunratty Castle Saturday 25 February at 5.30pm, with not a bicycle in sight. Bus leaving Kilmallock at 4.30pm. Total cost for bus and banquet is €60. Doesn’t bode well for cycling Sunday morning but the crack should be mighty. So grab your partner and contact John “The social secretary” Carey at 087 2701771 if you fancy the trip. “Turbo Thursday”. SWW Turbo Training classes continue every Thursday at 7.00pm in Bruree Hall. Bring your bike, turbo trainer, towel, and drinks. If you don’t have a turbo come along anyway, we plan to share all available turbos. Great training for guys, gals and underage cyclists. We’d like to invite more lady cyclists to join our club. Jan Murphy is looking after the ladies section and will be happy to give you any details you may require. Contact Jan on 087 2968173. New members are always welcome, bring a bike, helmet and a smile and you’re in. Obviously a good smattering of Lycra would be advisable too, we wouldn’t want you getting arrested. We have an easy paced cycle at 9.30 every Saturday morning. We’ve had an 8.00am group for the last few Saturdays but this is by prior arrangement and will be confirmed by text or on the club website. Our main weekly cycle every Sunday morning at 8.30. Midweek we have our “Wednesday Night Light Cycle” at 6.30pm, as the name suggests cyclists need a good front and back light and hi-vis clothing. The route is around the perimeter of the town and will benefit in part from street lighting. 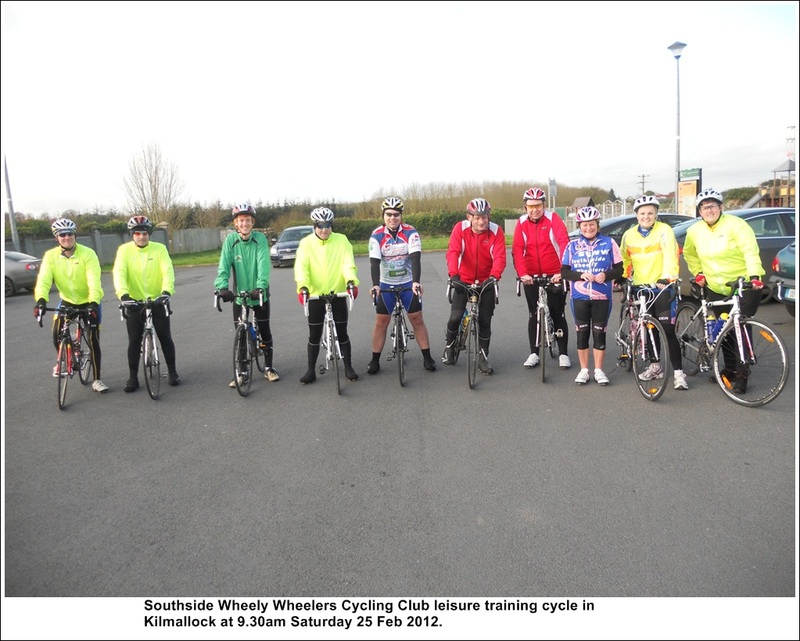 All cycles start from the car park beside Kilmallock Cycles. Keep an eye on the club websitewww.southsidewheelywheelers.comfor news. SWW cyclists trained like warriors Thursday night in the freezing Bruree Hall, steam rising off their backs, pools of sweat on the floor, hitting top speeds of 84kms per hour in top gear. Hells Bells!! In the words of Scotty, “She’s gonna blow Cap’n”. The following brave hearts were burning rubber, Gerard Finn, Brendan Houlihan, Ber Gammell, Paul Gammell, Michelle Gammell, Jonathan Moloney, John Carey, Mike Sexton and Brian McCarthy. Wednesday Night Light Cycle 01.02.12. Out cycling last Wednesday night were Gerry Ryan, Jerry Herbert, Mike Sexton, John Carey, Willie McCarthy, Mary McCarthy, Paul Gammell, Ber Gammell, Michelle Gammell, Sean Burchill, Adrian Gammell, Michael Gammell, Robert Shanahan, Mike Murphy and Mathew Gammell. Nice crisp evening for a spin, well done everybody. Word has it that Jerry Herbert’s legs looked even better this week! !